The iNSIGHT 70 is our high-volume solution for automated data capture applications that demand critical accuracy and mid-range output levels. With processing speeds up to 115 pages per minute, the iNSIGHT 70 is an affordable choice for data processing projects that require the capture of both traditional OMR (optical mark read) data and image data. Capture images and OMR data in a single pass through the scanner. You can gather multiple choice, objective test, or survey responses at the same time you capture images of short answers to constructed response items on tests or comments on survey forms. Images can be tied to an OMR data record, archived, and retrieved later for review or evaluation. Route essays, survey comments, and other images to # reviewers for final evaluations. Because the scanner reads both handprint and machine printed characters, you can design data collection forms to be more aesthetically pleasing and make better use of space. End users will also thank you for not requiring them to fill in large bubble grids for name, address, ID numbers, and the like. 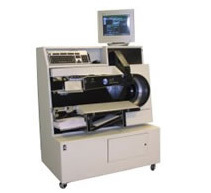 Lessen the amount of data you require from form users by pre-printing encoded data. You can also verify and cross-reference data to external databases by reading pre-printed bar codes, mark sense, and binary coded numbers.